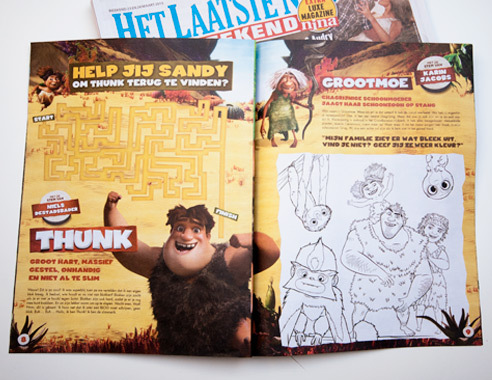 20th Century Fox Belgium and Netherlands wanted a strong pre-awareness campaign for their new animated feature “The Croods”, a hilarious movie about a prehistoric family. Curious about our creative eggs and historic photo shoots? Members of the press and other influentials can have a large impact on the popularity of a movie. That’s why we inform them thoroughly about the upcoming release, it’s makers and the local voice talent. To raise even more enthousiasm, we always try to suprise them with something special, something unique that has news value on its own. Something nifty as a litte extra for their article, or to take a cool picture for their Facebook or popular Twitter account. Working with a world famous chocolate maker. We decided to send a giant egg to the Belgian press and influentials. 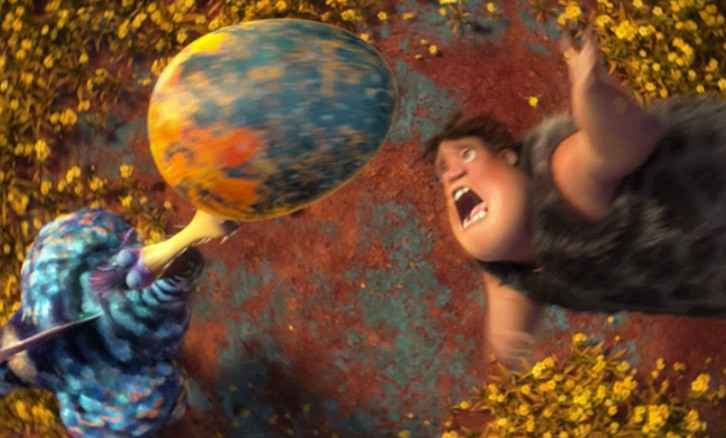 A perfect copy of the precious egg the Croods fight over in the movie. It was a chocolate egg, as Easter was near. 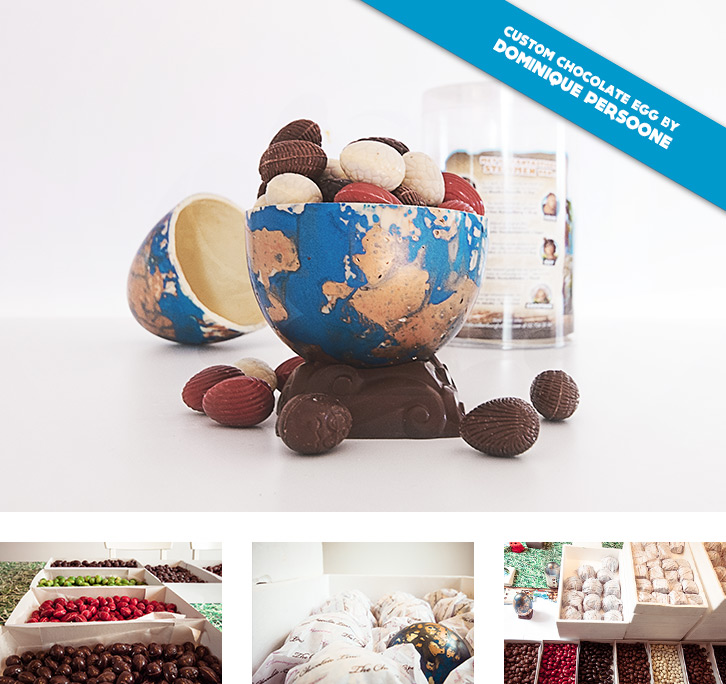 Not just any chocolate egg however, but an exclusive one, handmade by world famous chocolate expert Dominique Persoone, especially for them. Storytelling guaranteed, let the Twitter and Facebook bragging begin! The Dutch voice cast are all celebrities. We wanted to emphasize this in a creative way. Literally, even. 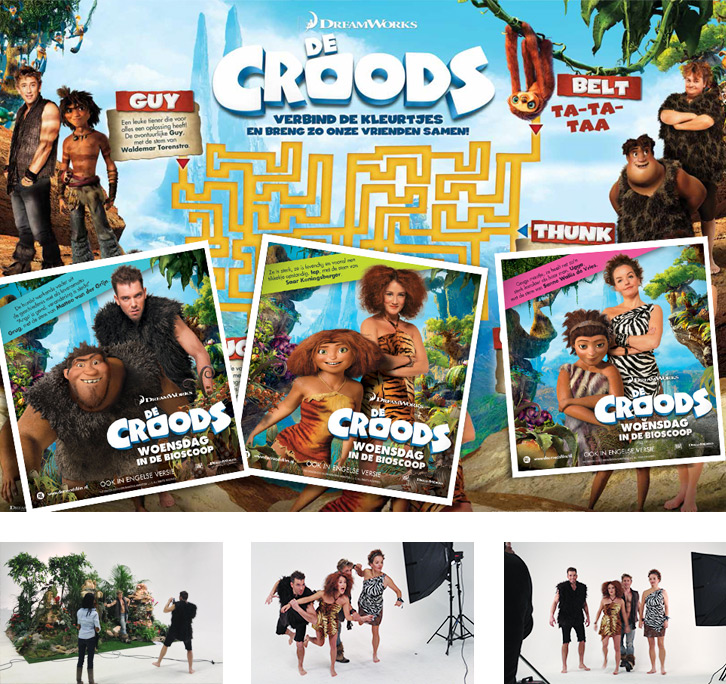 We organized a special photo shoot with the voice cast restyled as the character they are playing in the movie. A fun shoot, nice images and nice extra content for the Dutch press and influentials to write, talk, tweet or post about! Nothing is as boring as waiting for a bus. 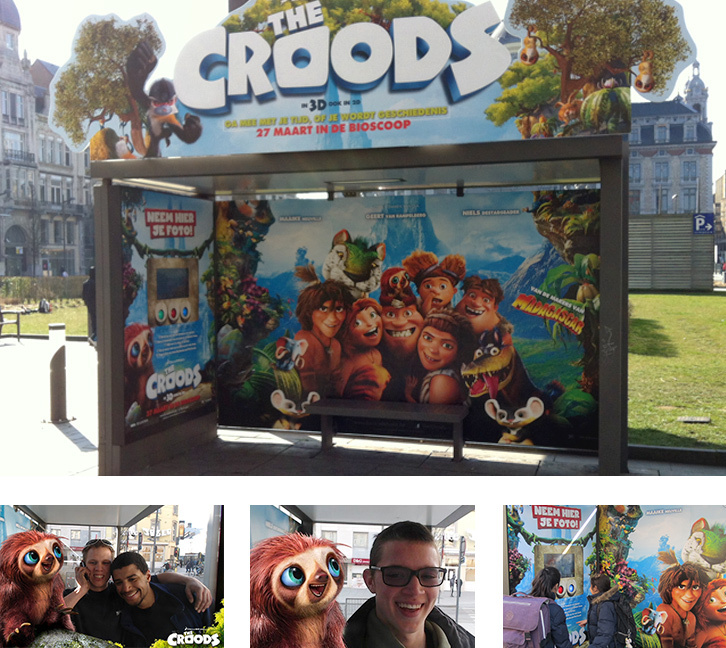 That’s why we realised a fun bus-stop idea together with ClearChannel. 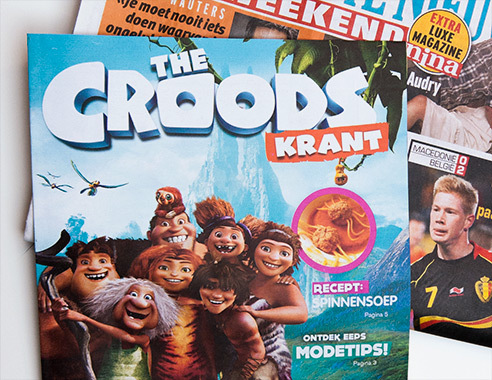 A built-in photo-tool that created an extra boost on the Facebook page for The Croods – while generating content for our digital campaign in the Antwerp railway station at the same time.